Aesthetically, the iMac was dramatically different from any other mainstream computer ever released. 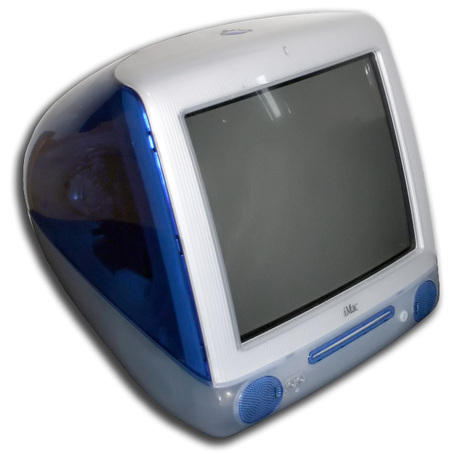 It was made of translucent "Bondi Blue"-colored plastic, and was egg-shaped around a 15-inch (38 cm) CRT. There was a handle, and the computer interfaces were hidden behind a door that opened on the right-hand side of the machine. Dual headphone jacks in the front complemented the built-in stereo speakers. Jonathan Ive, currently Vice President of Industrial Design at Apple, is credited with the industrial design. The iMac was the first computer to exclusively offer USB ports as standard,including the connector for its new keyboard and mouse, thus abandoning previous Macintosh peripheral connections, such as the ADB, SCSI and GeoPort serial ports. After releasing the industries most radically fresh desktop design and the most popular computer in 1998, what do you do for an encore? In Apple's case, you improve it at the start of the year with a faster processor and a choice of colors - and the colorful 266 MHz G3 iMac (a.k.a. Rev. C) was a runaway success in blueberry, strawberry, lime, tangerine, and grape. Unfortunately for Apple, the "powers that be" who determine which computer is the most popular decided to count each different color as a separate model, knocking the iMac from the #1 spot.